What are ways you can help your dog if they have a cold? How can you treat the flu in your cat? Does my cat have the flu? These are very common questions for pet parents and remember that you know your pet best. If you feel that your dog or cat needs to go to the vet, give them a call. You will have better piece-of-mind if you make the call instead of wondering or worrying. There are viruses that humans catch and there are viruses that your pets catch. They are different; however, they have a lot of the same symptoms as a human cold. Dog’s illness symptoms could include coughing, sneezing, runny nose, and discharge from their eyes. There are ways that you can help them get through the sickness just like a human. Keeping them hydrated, warm, and nourished, will help them kick the sickness quicker. Cats can get the cat flu. Kittens are more susceptible to catching the flu than adult cats with stronger immune systems. Most often it is called a feline viral upper respiratory disease. Your dog may be acting different and you’re not sure how to tell if your dog is sick or not. If your dog is noticeably more tired than normal, seems irritable, or withdrawn they may be sick. Sometimes your dog will sound wheezy when breathing, may have a cough that is persistent – lasting more than 24 hours, or have discharge from their nose and eyes. If you are noticing these signs in your dog is it time to take action. Treating an illness in your dog is a lot like treating a cold for yourself or your child. You will want to keep your dog warm. Avoid taking them out in the rain and keep your dog dry. Make sure you are limiting the time your dog is spending outdoors, especially in the winter. The cold air will make their breathing airways tighten and make it harder for your dog to breath. Keep your dog hydrated when they have a cold. If your dog is not drinking enough water, you may want to give them some chicken broth. It will provide nutrients to help your dog’s immune system kick the sickness. Just like us. Make your dog chicken soup. When your dog stays hydrated, it will help keep their nasal passages clear and help ease their stuffed-up nose. You will want to make sure that your dog is eating. Likely, your dog has not wanted to eat their food, the food dish has remained full and you are starting to worry that they are not eating. If you add boneless chicken or chicken broth to your dog’s food they may be more interested in eating. Canned food can be more appetizing to dogs when they are feeling sick too. Try different ways until your dog is eating a small amount. Dogs are more likely to eat their food if they can smell it. By keeping them hydrated and their nasal passages clear they will be able to smell their food. If you warm their food up just a little, it will create a stronger scent and they may be more likely to eat food. It can be hard for a pet parent to tell when their dog needs to visit a vet. A good rule to follow is if your dog is a puppy or elderly they should be checked out by a vet right away. If the dog’s symptoms increase and seem more intense, last more than two days, or your dog stops drinking liquids entirely, you may need to get them to the vet quickly. Cat flu symptoms include congestion making your cat sniffle and sneeze. Your cat may have a fever, drool more than normal, and their eyes may be red and watery. When your cat is sick, they will not want to play as much, they will avoid moving around, and want to sleep more than normal. Your cat’s appetite will be decreased when they are sick. It’s recommended to get some wet food for them to eat and warm it up a little. Cats eat when they can smell their food. When the food is warmed up, the scents of the food are stronger. Your cat is more likely to eat if they can smell the food. You can help your cat with their congestion by keeping their eyes and nose clear and removing any discharge. Wipe your cat’s nose and eyes with a warm damp washcloth when you see discharge. This will help them be able to breathe easier and ease some of their discomforts. Your cat will need help with grooming when they are sick. Your cat normally will actively keep themselves groomed and clean. When your cat is sick it is much harder for them to keep themselves groomed. You can help your cat get through a cold by helping them groom their fur. Using a warm, wet washcloth with short strokes on your cat’s fur will make it feel like they are being cleaned by another cat. It will seem soothing to have the damp and warm strokes against their fur. Spend about ten minutes in a steamy bathroom with your cat. This will help open your cat’s airways and help them breathe easier. Most cats do not typically like water, this may be a very difficult time for your cat. If your cat is comfortable in your arms, sitting in the steamy bathroom for ten minutes or so will help ease your cat’s breathing. Can you catch your pet’s cold? What about them? Can your dog catch your flu? Will your cat get sick if you cough or sneeze on it? The jury is still out, some research says that the flu virus may be able to be passed from humans to pets, however cold viruses are typically specific to each species. Meaning that your dog or cat’s sickness, cold, or upper respiratory infection cannot be transmitted to you. When you are sick, your family should keep a safe distance from you, but it is still safe for you to curl up with your cat or dog. Getting cozy with your beloved pet will help comfort you and support you and the same is said for your pets. 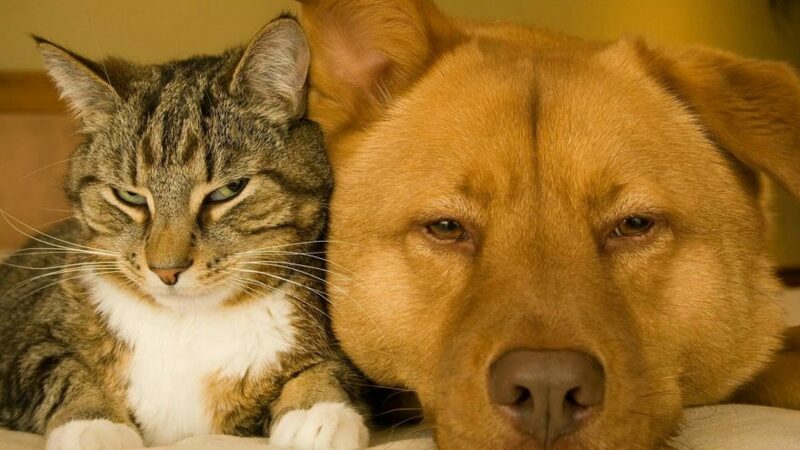 If your pet is sick, let them cuddle up with you and find comfort. To recap what we have discussed, try to keep your pet comfortable, hydrated, and nourished. Make your dog or cat feel less congested by wiping their eyes and nose with a warm washcloth. Getting rid of the goop that is clogging their tear ducts and nostrils will help them feel better. If your dog or cat is not getting better after a couple days, call the vet. You’re better off checking in with a veterinarian than missing something and not helping your beloved family pet that is under the weather.